Also known as “Cappadocia,” this region in south-central Turkey is known for many things: fine wine, wild horses, medieval Christian caves, and strange, mushroom-shaped towers (known as “fairy chimneys”). The area is a popular tourist destination—particularly among Turkish and Russian nationals—and has many areas with unique geological, historic, and cultural features. The largest tourism sites exist in four cities: Nevsehir, Kayseri, Aksaray, and Nidge, and the most important towns and destinations are Ürgüp, Göreme, Ihlara Valley, Selime, Guzelyurt, Uchisar, Avanos, and Zelve. At dawn or dusk, enjoy one of the region’s hot air balloon rides—a popular an inexpensive way to experience the strange sedimentary rock formations, which were created and deposited by ancient volcanoes several million years ago. Hiking, backpacking, and general sightseeing is available nearly everywhere you can find the strange rock formations. 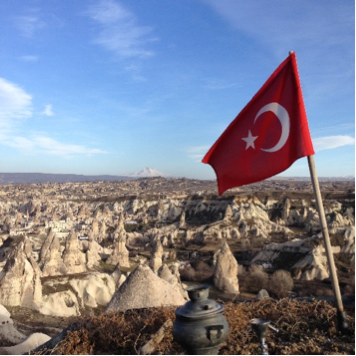 A visit to this region should include a visit to the Göreme Open Air Museum, which houses a spectacular city built into the spires of sedimentary rock. When you visit, be sure to check it out. After that, visit the Derinkuyu Underground City—the world’s largest excavated underground city. Not recommended for those who experience claustrophobia, it extends to a depth of approximately 200 feet and is large enough to have sheltered as many as 20,000 people. When you’re done with a full day of exploring Kapadokya’s medieval caves and underground cities, retire to one of the region’s many cave hotels—converted-cave suites that feature artifacts and modern flourishes, such as stone fireplaces.